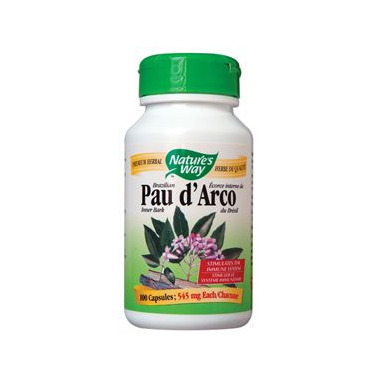 Pau d'Arco is used in Traditional Western Herbalism to help treat sore throats and colds. Also known as Lapacho or Taheebo, Pau d'Arco is native to the rainforest. Potential medicinal breakthroughs are lost on a daily basis due to rainforest destruction. Nature's Way encourages active participation in saving the world's natural rainforests. Directions: Adults take 2-4 capsules 2-3 times daily. Do not use for more than 7 days. Other Ingredients: Hydroxypropyl methylcellulose, magnesium stearate. Warning: Consult a health care practitioner prior to use if you are pregnant or breastfeeding. Notes: Store in a cool, dry place out of reach of children.